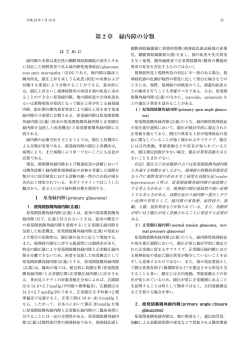 塞, appositional angle closure とも呼ばれる)のみの症例. 1) 北澤克明：緑内障クリニック. 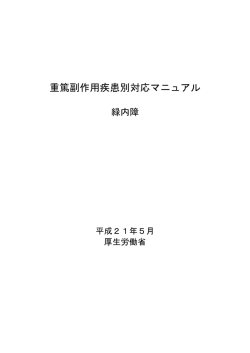 改訂第 3 版, 金原出版, 東京, 1996.
for Glaucoma, Second edition, 2003. 3) Ritch R, Shields MB: The Secondary Glaucomas. 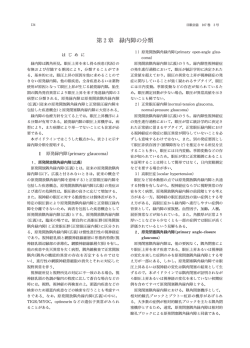 Mosby, St.
視標の明るさは, 1 a (12.5 asb)から 4 e (1000 asb)まである. 経障害機構. 日眼会誌 96：1501 1531, 1992.
therapeutically reduced intraocular pressures. Am J Ophthalmol 126：487 497, 1998. 713; discussion 829 730, 2002.
results from the Early Manifest Glaucoma Trial. Arch Ophthalmol 120：1268 1279, 2002. 回の眼圧測定, 視神経観察, 年に 1∼2 回の視野測定を行う. グリセオール：300∼500 ml を 45∼90 分で点滴静注する. グリセリン：50％内服液 3 ml/kg を 1 日 1∼2 回投与する. 1％あるいは 2％ピロカルピンを 1 時間に 2∼3 回点眼する. Tajimi Study. 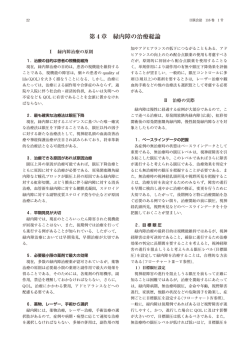 Ophthalmology 111：1641 1648, 2004.
and secondary glaucoma in a Japanese population. Ophthalmology 112：1661 1669, 2005.
edtion, Mosby, St. Louis, 121 190, 1999. 野の進行様式. 臨眼 32：39 49, 1978. Glaucoma. Vol. 1. Grune & Stratton, London, 37 77, 1986.
edition. Mosby, St. Louis, 121 190, 1999. 両眼の垂直 C/D 比の差が 0.3 以上3). 1) Gloster J, Parry DG: Use of photographs for measuring cupping in the optic disc. Br J Ophthalmol 58：850 862, 1974. J Ophthalmol 86：238 242, 2002. で 70∼93％, 二年で 58∼86％という報告がなされている16) . く, 通常の MRI 撮影であれば偏位せず, 安全とされている. Francis BA: Aqueous shunts in glaucoma. Cochrane Database Sys Rev. 2: CD 004918, 2006. Asian population. Ophthalmology 111：1383 1388, 2004. M, Varma R: Experience with the Baerveldt glaucoma implant in the management of pediatric glaucoma. Am J Ophthalmol 139：847 854, 2005. Rodriguez N, et al: Pars plana Baerveldt implantation for refractory childhood glaucomas. J Glaucoma 18：412 417, 2009.
and corneal transplant. J Glaucoma 19：124 131, 2010. Study. Am J Ophthalmol 148：670 684, 2009. Ahmed glaucoma valve implant in advanced glaucoma. Ophthalmology 105：1968 1976, 1998. II: Comparison of polypropylene and silicone Ahmed glaucoma valves. Ophthalmology 113：1320 1326, 2006. Pediatr Ophthalmol Strabismus 42：274 283, 2005. Maris PJ Jr, Ishida K, Netland PA: Comparison of trabeculectomy with Ex-PRESS miniature glaucoma device implanted under scleral flap. J Glaucoma 16：14 19, 2007.
device implantation versus trabeculectomy. Am J Ophthalmol 151：507 513, 2011.
extension of a clinical trial comparing the EX-PRESS glaucoma filtration device and trabeculectomy in primary openangle glaucoma. Clin Ophthalmol 5：527 533, 2011.
combined surgery with phacoemulsification. Br J Ophthalmol 89：425 429, 2005.
alone or combined with phacoemulsification cataract surgery. J Glaucoma 18：488 491, 2009.
clinical pilot study. Am J Ophthalmol 138：1049 1051, 2004.